Acne is one of the most common skin conditions in the United States and while it is common, accurate skin education and information isn’t readily available which can make it difficult to treat the source of acne and get clearer skin. Almost everyone develops acne in at some point in their lives and to some degree, but it primarily affects teenagers who are constantly undergoing hormonal changes. The acne may be mild with just a few, occasional pimples, or even more severe with nodules and cysts and of course everything in between. Treatment depends on the severity of the condition but most people can effectively treat acne without having to take any oral medications and while using high quality skin care products like Solvaderm. 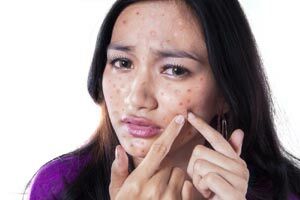 Acne can be caused by many different factors but it primarily is a hormonal condition. Sensitivity to these teenage hormones, combined with bacteria on the skin, and excess oil glands, can cause acne. Foods that are oily and anything that increases bacteria on the skin like headgear can make acne worse. Acne can also be caused from excess skin cells that are never properly exfoliated from the skin. This is exacerbated when there is too much oil production so proper skin care is essential with acneic skin. Medications, diet as previously mentioned, and stress can make acne worse. There are a lot of misconceptions about how to adult acne. Some folks even say that you should let acne resolve on its own which couldn’t be farther from the truth. Dermatologists are well aware that letting acne runs its course is not ideal because without treatment, dark spots and permanent scars can appear on the skin as untreated acne clears. The right treatment for acne often can lessen the length of breakouts and make skin feel better overall. It is always recommended to see a professional when attempting to treat acne but there are great ways to treat acne on your own. Be sure to avoid greasy foods and to keep your skin as clean as possible. Be sure to avoid cosmetics that contain oil and pick the right skin care routine for your skin. Be sure to choose a cleanser specially formulated for acne prone skin. You want to make sure you wash your face gently, as any added force to the breakouts may worsen the acne or cause scarring. Use only noncomedogenic moisturizers and products which do not aggravate acne. A holistic blemish care regimen like Solvaderm’s will help restore the skin’s natural moisture balance for radiant, clear complexion. One specific product is Zeroblem, a dermatologist-developed spot treatment designed to clear up breakouts quickly by intensively targeting and healing unsightly blemishes. This product is formulated with only the best skin clarifying compounds that penetrate deep into pores in affected areas to remove dirt and other impurities while promoting a clearer complexion, easing redness, and providing professional level results without pain or overly harsh ingredients that can cause irritation or excessive dryness. Be sure to visit their website for more details or ask your skin care professional.